Hike one. Hike two. And the play begins. Credit to Mr. Heisman, the term “Hike” initiates the game of American football. Perhaps the term infiltrated the mindful mind of former UW and NFL receiver, Mark Pattison and programmed his neurotransmitters for what he would be and do next after he left the striped grass and goal posts of the game that has stolen the hearts of millions. He was a typical All-American high school player and landed a position on the field of coach Don James’ infamous purple reign of the ‘80s at the University of Washington. They won a lot. I watched them. James taught Mark and his teammates the building blocks of success to reach peak performance. Mark recalls thinking, I need to up my game if I want to stay in it. He quickly realized he must put in extraordinary efforts to be great at this new level. He ran thousands of extra steps in Husky stadium when the sun went down and the rain came down even harder. You know those scenes in the movies where the underdog star realizes, “oh my, I need to get myself together and makes a game plan to be great.” To win. The protagonist chooses. He decides against all odds. We get an Oscar-nominated soundtrack song thrumming in the background of the unfolding scene to fill our ears and hearts up after a few minutes of watching the star. Run, jump, fall down, get back up, pray, study — all that. The end result is that he shows up, no matter what, and we are all rooting for him to win whatever he was wishing for. We are all in with him. He inspires us to be that guy. To be our best. He makes it possible by showing us who he is when he decides to be his best. This is who Mark is to me and thousands of others. He works hard. He decides to be his best. He won. He wins. He celebrated between goal posts at college and he was invited due to his prowess moves and dedication to play with the big boys in the NFL, for several years. And then he created several successful businesses. He used the wisdom of his playing years, the coaching and teamwork strategies to succeed once again, in this new arena. And no, it was not a cake walk. He looks like the prom king, the All-American Everything. And he is wicked smart. And kind. How is he the way he is? I want to know, so I asked him. The childhood indoctrination we all get and how we learn to be our best or not, originally shaped his desire to succeed. His take away from early youth was that he felt he needed to keep striving for new summits to his successes. More. Work harder. Be even better. Be a champion in academics and athletics. His coaches taught him team work. Getting smashed to the ground a zillion times taught him to get the heck back up again and again. We went to college together. Recently, we reconnected and I was privy to his clever, meaningful, lifting writings and his new story plot. He decided after a chapter changing loss a few years back, to challenge himself, again. He had hit his grief peak. What’s next, he asks? After walking in circles around his block with his chocolate lab, Theodore, and feeling the blues, he got an idea. He asked himself, how did I get here? Then, what can I do about it? What am I good at? He decided to rekindled an old passion for climbing. 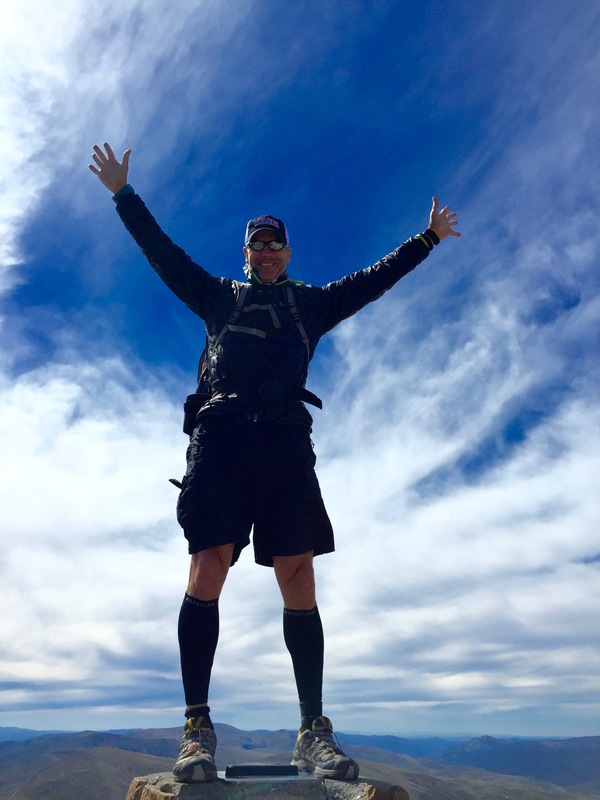 He decided to be the first NFL player to hike the Seven Summits (yes, that includes Everest and all the rest). So, he wipes his tears, his sorrow on his sleeve and starts climbing. He has chosen to stay fit and positive. He can get up a hill fast. He was blessed with super-sized lungs and strong fast leg muscles. He likes scaling vertical. He decided to document his journey. He has hiked four out of the seven, so far. He is back in the game. The new play has begun. I faintly hear Vangelis’ Chariots of Fire in the back ground while I interview Mark. He makes me want to get out of my pajamas and billy goat it up the nearest hill to Queen’s “We are the Champions”. I am a mere mortal, now inspired. The 17 Sherpas that were his new teammates for game day, basked in his generosity and positive nature (he’s too humble to say this but it’s true). He got up that Kilimanjaro hill. Sleeping in a tent. Carrying a 50 plus pound pack. Sucking wind. High altitude. Hours turn into days on the vertical goal he had set. He listened to autobiographies (not the theme to Rocky or Rudy as I dreamt up in my head). Receiving clarity and joy on the mountain with each step and with his evening journaling. He reached the summit with three of the Sherpa teammates. That night when he reached his first Summit, they celebrated MP. They danced. They honored his success and his safety. And he cried. He had struggled at 19,000 feet; he had lost his energy. And he decided to do it. This took an extra dose of grit. And he did it. He felt such love and honor for himself and his team. For the mountain he had scaled. For the touch down. I hear and read his words, his story, and I am transported ever so briefly to the very essence of the achievement itself. His loss offered the space for a new life chapter to begin. He was cracked wide open on the mountain. He felt it. Life. Thanks. Fear. Pain. Hope. Joy. He stayed in the present, in the now. In the right now every single step of the way. And look what he did. This lifts me up. When something is stripped from of us, we must grieve and decide to love ourselves enough to take one step toward where we wish to go. Look up. That is it. One step at a time can get us to the peak of our lives. Mark shares that his first summit was the beginning of the end of his past story and the beginning of the beginning of this new one. Mark has suffered plenty of tackles on and off the field. He gets back up. This is power. He inspires me, all of us, to get back up. To surrender when we feel afraid. To make a game plan. To ask for help. He invites us to do our very best to reach our own summits. He wanted to fill his empty bucket. And sharing his journey is keeping it full. He is testing his personal strength physically, spiritually and emotionally. Daily. He shares that we can all have a sense of the possible even if it at first appears to be the impossible. He invites us to set realistic goals. Make a plan and move toward the goal lines. Be vigilant. Be moderate with distractions and unhealthy food and drink and thought. Be vulnerable and open. Where your focus is your energy follows, he says to me. Decide. Work it out on paper. Put your feet on the floor and walk out the door. When a player receives a ball and runs it past the obstacles and opposition and clears the goal, he celebrates, and that is precisely what this MVP MP intends to inspires us to do. Tackle our challenges and reach our own personal summits. That lifts me up. We can all touch down to self love, wonder and joy when we make the decision to lift our lives up. He’ll be coming Around the Mountain again soon. Yippee Aye A.